Coming soon to a Sharks game near you. Back in October, when the NHL season was still ripe with possibility, Ryan and I went to the San Jose Sharks’ morning skate at Prudential Center as guests of the team. We were there so Ryan could attend practice and visit the players for the second time in a matter of months. While we were watching practice, Dan Rusanowsky, the Sharks’ radio announcer, wandered over. I’ve had some professional interactions with him over the years, and he met Ryan at our visit in Philadelphia last February. Rusanowsky quizzed Ryan all about his Sharks fan-dom, and I smiled as they engaged in a lively hockey conversation. Ryan is never as comfortable in conversation as when the subject is hockey. Rusanowsky asked Ryan his age, and when he received the answer he told him, “we really need to win a championship in the next few years.” It was his theory that the early teenage years are when sports fans’ memories are the most impressionable, when winning a Stanley Cup would be most meaningful to Ryan. Sadly, it does not look like this year will be the year. San Jose has had an inconsistent year and currently sits on the far edges of playoff contention. With eight games remaining, the Sharks probably need to win them all, and get some help from teams ahead of them. If not, the NHL’s second-longest streak of consecutive playoff appearances will be broken. 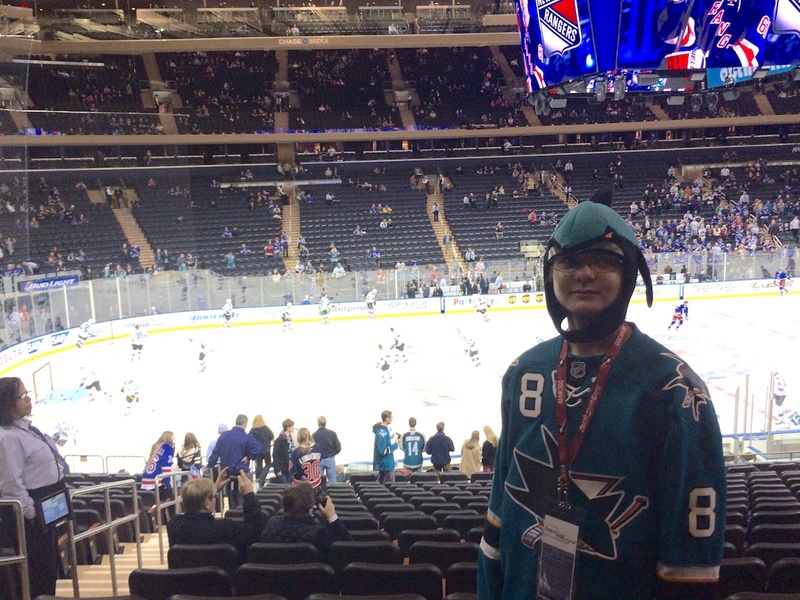 We attended that game in New Jersey in October, and watched the Sharks grind out a 4-2 win over the Devils. The next day, Ryan and I when to Madison Square Garden, where we saw the Sharks lose to the Rangers, 4-0. Tomorrow, we’ll make the drive down the New Jersey Turnpike to see the Sharks take on the Flyers in Philadelphia. (Aside: It was very nice of the NHL’s schedule-makers to schedule three of the Sharks’ four New York metropolitan-area games this season on weekends). As the Sharks’ playoff fortunes soured on a season-defining road trip, I checked with Ryan if he still wanted to go. Had this been a few years ago, the answer might have been different. Or I might not have offered. But Ryan continues to answer with an enthusiastic “yes” each time the quetion is asked. I am so proud of how he has handled the disappointment of this season. Perhaps it’s not suprising from the kid who wore a Sharks t-shirt to school the day after last year’s soul-crushing Game 7 playoff loss to the Los Angeles Kings, but it still marks tremendous maturity and growth from Ryan. Way back when Ryan first got very interested in hockey, he followed the Washington Capitals, like me. When they endured a blowout loss in a Game 7 one year, Ryan absolutely lost it. I had to turn the game off in an effort to console him, and I blamed myself for exposing him to something that caused him such pain. That wasn’t the last time I felt that way, but those thoughts are always fleeting now. I have learned, and observed up close, the social connections that sports provide. I know there is nothing that brings him as much happiness as watching his favorite team play live. The look on his selfie-taking face when we made our trip to San Jose in February is proof. He loves the wins. He can handle the losses. More importantly, his connection to hockey is what centers him. It has given him goals to pursue, a sense of belonging with peers, and immense pride in personal achievement. It has provided him with some amazing experiences . It has opened his eyes to the possibility of a career. In fact, his only concern about the trip to Philadelphia is isn’t the notoriously tough Flyers fans. It’s if we can make it home in time for him to play open hockey with his friends. When this regular-season ends, and with it the likely end of the Sharks’ season, there will be no tears. I no longer worry about what the fall will bring. Ryan’s spring league season is about to start. We’ll watch the playoffs together on TV. We’ll discuss the Sharks’ offseason moves. And next fall, a new season full of possibility will dawn, and we’ll do it all again. All of which brings me back to that conversation with Rusanowsky. I’m sure in one sense he’s right. As you get older, things like life intervene and tend to interfere with one’s sports passions. Except that I have no relevant experience. I became a fan of the Washington Capitals at age four and I’m still waiting to experience a championship. Should it occur in my lifetime, at any point, I’m sure I’ll cherish it plenty. Along the way, I’ve learned to love the individual moments that fandom provides. Besides, I know a hockey lifer when I see one, because I was (and am) one. I see so much of myself in Ryan, and after a decade-plus of being forced to pay attention to his differences, that is perhaps the most rewarding aspect of all.